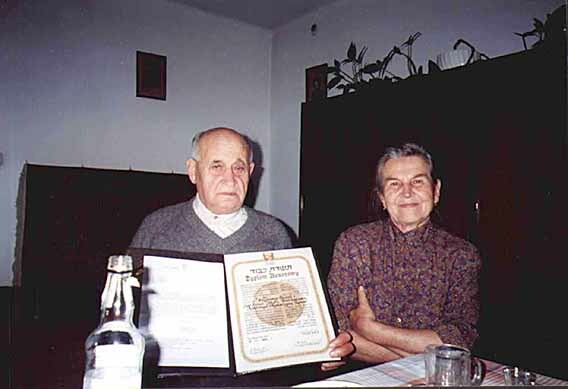 Maria and Josek Pacula with Yad Vashem Certificate as Righteous Gentile The Pacula family: Both parents and the children were all named in the certificate. However, at the time of the granting of the certificate all had passed away but Josek. They saved many Jews from shtetlach near Kañczuga, including Howard Nightingale's late mother who was taken from Zagorze to be in hiding with this family. Maria Pacula married Josek after the war and never met my late mother. However, she was the one with whom my late mother corresponded. It was Josek and she whom she addressed in all her letters as "my Saviours". Maria recognized me as I entered her home, from the pictures my late mother had sent over the years.